I haven't found a reference to the rails at this theatre, and would be grateful for any further information about them. Searching for references to rails and tracks at Greek theatres I found Ekkyklema literally a 'thing rolled out'; in a theater, a platform rolled out on wheels through one of the doors of the skene on which a tableau was displayed representing the result of an action which had taken place indoors and therefore was unseen by the audience. Another reference to rails I found was an article on The Eiskyklema in the Eretrian Theatre (facsimile) and Full text (American Journal of Archaeology, Vol 2 No 3/4 May-Aug 1898, by A Fossum), further consideration of 1891 excavation at Eretria, with a sentence following description of ekkyklema with "That upon which it moved was called eiskyklema". 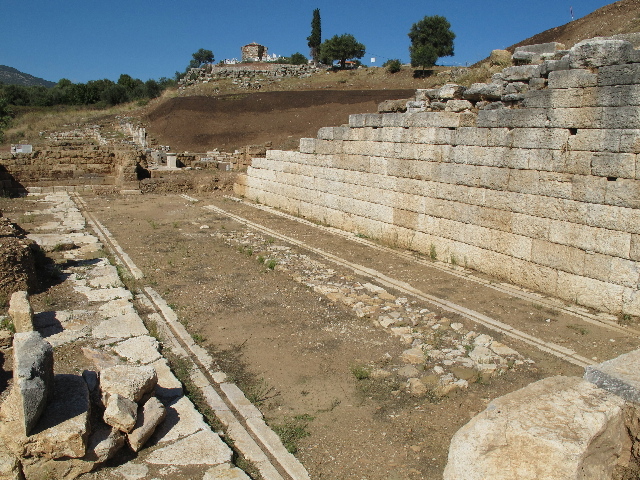 The marble slab rails at Eretria went back behind the stage, whereas those in the photo are at the side of the wings. "Let us rather concentrate on certainties. The Greeks were clearly familiar with the principle of the true railway on very short systems. The theatre at Sparta, as rebuilt about 30 BC, had a stage building that was only occasionally needed for performances. It was therefore not a fixture, but mobile: parked normally in a kind of carriage shed to one side and rolled into place when required on multiple wheels running in three widely-spaced rows of channelled stone rails. It measured about 34m long by 8m wide. (reference, Heinrich Bolle, 'Das Theater zu Sparta', SBAW, phil-hist Abteilung, Jahrg 1937 Heft 5.) Much the same arrangement also appears at the theatre at Megalopolis from the third century BC, where no trace was found of rails perhaps because they were of wood rather than stone?. (reference, Plan in Margarete Bieber, The History of the Greek and Roman Theater (Princeton, 1961), fig 276." Dr Michael Jonathan Taunton Lewis was lecturer in industrial archaeology at the University of Hull, and wrote many papers on railway history. Articles I have found seem to have much speculation about the scenery in ancient Greek theatres; there is enough literature to encourage ideas, and not enough to confirm or disprove them.